While business is booming at the ScotShop in Hamelin, Vermont, proprietor Peggy Winn doesn’t have time to toast her good fortune thanks to her hot-tempered, fourteenth-century Scottish companion. Being thrust into the modern world hasn’t been easy for Dirk, but Peggy is at her wit’s end trying to keep the ghostie galoot in line. Peggy and Dirk are back and have their hands full, well as much as a ghost can have his hands full. If you haven’t read the previous story you need to know that Dirk came home to Vermont after a trip Peggy took to England. She purchased a shawl and never knew it came with a ghost as a bonus item. Cross country skiing is a big thing in Hamelin, Vermont, even the chief of police straps on his skis and grabs his poles every once in a while. His first trip of the season goes horribly wrong when he falls and breaks his leg. With no way to call for help and no one around, he uses his ski to splint his leg and crawls to a nearby cabin. He never expected to find a dead body there. Sadly the guy isn’t missed right away but when he is found he tries to wrap the case before he has all the information. Peggy and her friend Karaline along with a certain cranky 14th century Scotsman try to find out what really happened. When Karaline gets shot things get more than a wee bit serious but Peggy isn’t giving up. I love that Dirk and Peggy are at odds through most of the story. It has to be hard having him around all the time and answering all his questions. The author keeps the Dirk’s way of speaking genuine to his time period and his reactions to modern day things may me laugh out loud several times. When he gets on her nerves Peggy just folds up the shawl and he disappears. We don’t know where he goes but he doesn’t appreciate being dismissed in that way at all, but it gives Peggy a bit of a breather. The rest of the characters are fleshed out well and each holds their own in a twisted mystery that will keep the readers on their toes. We also meet a wonderful Scottish terrier named Scamp who seems to make himself right at home in the ScotShop. We are provided with plenty of suspects and several red herrings. I was kept guessing the whole way and figured it all out right along with Peggy. 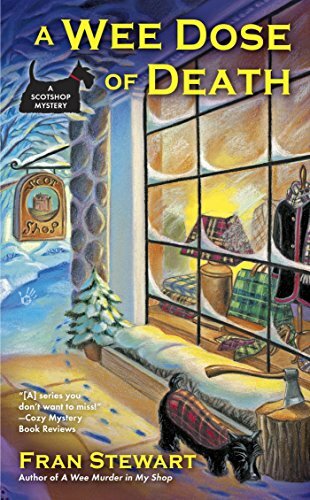 Fran Stewart has given us a captivating cozy, with witty characters and top notch mystery. I look forward to the next installment, A Wee Homicide in the Hotel was released this month and I will be reading it soon. I don’t know how I never heard of this series. I love the premise and will be adding it to my goodreads list! Love the Scottie dog on the cover! Thanks for the chance to win, it sounds great! That cover has me thinking, aaw, how cute. LOL This is perfect for a weekend cuddle up on the couch read.